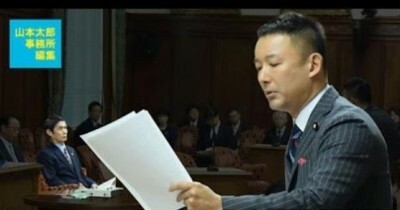 Taro Yamamoto of the Liberal Party is a member of the Chamber of Deputies. He is one of the few parliamentary members defending the rights of victims of the TEPCO Fukushima Daiichi nuclear power plant disaster. The Association Nos Voisins Lointains 3-11 translated the questions of Taro Yamamoto to the Chamber of Deputies’ Special Commission on Reconstruction on 18 November 2016*. The content of his questions reveals the inhuman situation faced by the victims in the framework of the Japanese government’s return policy . Thank you. I am Taro Yamamoto from the Liberal Party. I would like to ask questions as the representative of a parliamentary group. Declared on 11 March 2011, the state of nuclear emergency has not yet been lifted to date, 5 years and 8 months after the accident at the TEPCO Fukushima Daiichi nuclear power plant. Today, I will address a subject that is well known by the members here present. I will start with the subject of the radioactivity controlled area. This is a demarcated area frequented by workers with professional knowledge who are exposed to the risks associated with ionizing radiation, such as an X-ray room, a research laboratory, a nuclear power plant and so on. Here is my question. There are rules that apply to controlled areas of radioactivity, are not they? Can we eat and drink in such a controlled area? Here is the answer. According to the Ordinance on the Prevention of Risks from Ionizing Radiation**, eating and drinking are prohibited in workplaces where there is a risk of ingesting radioactive substances orally. Of course, it is forbidden to drink or eat there. So it’s obvious that it’s not possible to spend the night there, is it? Even adults cannot stay for more than 10 hours. You are well aware of the existence of this Ordinance. This is a rule that must be respected in order to protect workers exposed to risks related to ionizing radiation in establishments such as hospitals, research laboratories and nuclear power plants, isn’t it? It contains the definition of a radioactivity controlled area. This is Article 3 of the Ordinance in File No. 1. It states that if the situation corresponds to the definition described in Article 3/1 or to that specified in Article 3/2, the zone shall be considered as a controlled area and a sign shall be posted there. I will read parts 1 and 2 of this article. 1: The area in which the total effective dose due to external radiation and that due to radioactive substances in the air is likely to exceed 1.3mSv per quarter – over a period of three months! When the dose reaches 1.3mSv over a period of three months, a zone is called “controlled radioactivity zone”. Thus, with 40 000Bq / m2, the zone is classified as a “controlled zone of radioactivity”. It is therefore necessary to monitor not only radioactivity in the air but also the surface contamination, ie the ground dose of radioactive substances, ie other elements in the environment, and to manage the area in order to protect workers from radiation-related risks, isn’t it? A radioactivity controlled area is defined both by the dose rate of the ambient radioactivity and by the surface density of the radioactive substances. The point is that the risk in a situation where the radioactive substances are dispersed is quite different from that in the situation where the radiation sources are well identified and managed. At present, the evacuation order applied to the evacuation zones following the nuclear power plant accident is lifted when the ambient radioactivity dose rate becomes less than 20mSv / year. Here is my question. Concerning contamination, apart from the dose rate of ambient radioactivity, are there any conditions to take into account in order to lift the evacuation order? Please answer yes or no. Concerning the conditions necessary for the lifting of the evacuation order, as far as the radioactivity measurements are concerned, it is only the certainty that the annual cumulative dose rate of ambient radioactivity is less than 20 mSv. You did not understand. I asked you to answer yes or no. Are there any other conditions other than the dose rate of ambient radioactivity? To lift the order of evacuation below 20mSv / year, what are the conditions regarding the contamination? The fact is that regarding contamination, there are no other conditions than the dose rate of the radioactivity in the air. This is abnormal. You, who belong to this Commission, certainly understand to what extent this situation is abnormal. In the definition of a radioactivity controlled zone, apart from the dose rate of radioactivity in the air, account is taken of the substances dispersed and then deposited, that is to say contamination in the soil etc., which means a criterion of 40 000Bq / m2 is established for surface contamination. However, in the return policy to return populations to territories where the annual cumulative dose rate is less than 20mSv / year, the condition of soil contamination is not considered necessary. The latter is not an evaluation criterion, the only criterion used is the dose rate of the ambient radioactivity. Politicians and officials who consider this to be a regular situation do not deserve to receive wages paid from tax revenues. Our job is to protect the life and property of the people. Now, you lighten those conditions. You create, at your discretion, a rule that is less stringent than that applied to workers with a professional knowledge of radioactivity. What are you doing ! Following the Chernobyl accident, laws have been established in Russia, Belarus and Ukraine, measuring both the dose rate of radioactivity in the air and the contamination of the soil. Why ? That goes without saying. This is because it is difficult to grasp the amount of irradiation suffered by the population only with measurements of ambient radioactivity. In Ukraine, with 5mSv / yr, a measure corresponding to that of the controlled radioactivity zone, the population is evacuated, and even with 1mSv / year which corresponds to the limit of the average dose rate for the public, ‘they have the right to move out. This law known as the Chernobyl law is still in force. On the other hand, what is the situation in Japan? According to the Cabinet decision of June 2015, the evacuation order is lifted if the dose rate in the air is less than 20mSv / year. There is no problem ! For example, if you stay 24 hours in a controlled area of radioactivity, you are exposed to a dose of 5.2mSv / year. However, the criterion for the lifting of the order and the return of the population is 20mSv / year or less. The zoning is determined by a dose 4 times that of a controlled zone of radioactivity. Go back, live there, continue your life, rebuild, what is this! I can find no other expression than “completely twisted”. Can we still call it the State? I think it’s better to call it the mafia. It’s so inhuman! The government appears to have adopted dose limits of 20 to 100mSv as recommended by the ICRP*** on radiation exposure limits after an accident. However, when considering the health effects on the population, the most reasonable would be to adopt 1mSv, the lowest dose measurement for radiation limit for public health, according to the global consensus. The right to evacuate must be granted to the population until the dose rate falls below 1mSv / year. The right to decide when to return belongs to the victims. Why do you determine zoning as you wish? The State must make every effort to reduce the dose as close as possible to 1mSv / year, maximum dose in a normal situation. Then the State, the administration should warn the people, and let them make their own decisions. That would be the fairest way. The State should behave like this. Who is responsible for this accident? It is TEPCO. Who supported it? It is the State. It is clear who the perpetrators of the crime are. And yet, only the charges of the criminals are being relieved. If it is permissible to develop zoning and associated rights to the convenience of the criminals, this world is a hell then. In the town of Minamisoma in the coastal region of Fukushima Prefecture, three types of evacuation zone were established after the earthquake. In July 2016, the evacuation order was lifted in the “evacuation order lifting preparation area” and in the “restriction of housing” area. There is only one home with two people remaining in the “area where the return is difficult”. This is the map of soil measurements collected and measured in the territories where the decontamination works have been completed. The colors show the levels of contamination. The blue colored area indicates where the contamination measurements are below 40 000Bq / m2, ie below than the level of a radioactivity controlled zone. There is only one, at the right bottom. Apart from this one, at all other places, the colors show corresponding measurements above the measurements of a controlled zone of radioactivity. There is even a colored place in gray where the measurements exceed 1 000 000Bq / m2. There are people living there! Compared to the extraordinary ambient radioactivity dose rate observed immediately after the accident, the dose rate of radioactivity in the air decreased considerably. It is not the same order of magnitude. However, according to the inhabitants, even with 0.1μSv / hr of ambient radioactivity dose rate, soil measurements may still be equivalent to those of a radioactivity-controlled zone. It is senseless that only the dose rate of ambient radioactivity should be taken into account as a condition for lifting the evacuation order. It is so irresponsible and neglectful. It is exactly the opposite of protecting the life and property of the people. People do not live floating in the air at 1 meter above the ground*****. They sit down, lie on the ground, they stop to chat, standing or sitting. Children do not play on asphalted roads only. They can venture into the bushes. Children play freely. There are some who put soil in their mouth. Remember how you were when you were still a child. Gutters where contamination is concentrated provide one of the favorite playgrounds for children. Mr. Masuchika Kono, a member of the above-mentioned project group, who was with the Engineering Department of Kyoto University, a specialist in nuclear engineering, a graduate of radiation manipulation, collected soil at the Minamisoma Michi-no-eki roadside (service and parking area), and passed it through a sieve of about 100 microns. The measurements showed 11 410Bq / kg of Cs. These dust rises with the winds and the passages of the vehicles. In daily life, dust is inhaled by the people. You do not take internal radiation into account, do you? You calculate the amount of internal radiation by applying just a coefficient, but do not include internal radiation in real life. Some people self-evacuated from areas outside the evacuation areas under evacuation order, as they consider that the State policies do not protect the children, their lives. To these persons, within the framework of the Disaster Relief and Disaster Relief Act******, dwellings – “temporary accommodation”******* – were made available. However, in March 2017, next year, the free housing provision will be suspended. You are telling them that there is no more problem; Why then stay evacuated? That’s it, isn’t it? Those displaced from areas outside evacuation areas under evacuation order fled because their home and living environment are contaminated as a result of the TEPCO nuclear accident. However, since their homes are located at some distance from the nuclear power plant, they were not included in the evacuation zones that the state established unilaterally. As a result, these displaced persons receive no public support except the provision of free housing. And even this aid will stop in March 2017. It’s incredible to stop helping them. Moreover, what does it mean to stop the provision of free housing in March? It is the season when mobility is at its highest in the year. You expel them, force them to relocate at the time of the year when rents and costs become more expensive! You have no compassion. You are ruthless! (Note from the translator : Taro Yamamoto can no longer hold his tears) Who does something like that? I beg your pardon. Who orders such a thing? It may be admitted that the State would ask local governments to carry out polite negotiations with the displaced. No, it is nothing but expulsion. Does not the State intend to stop such a situation? I do not allow you to say that you did not know. You see the problem before you now! “Constant phone calls, visits without notice, and they shout at me asking what my intention is. They send documents to file, and leave passing notices in the mailbox. I am completely exhausted, physically and psychologically. “ This is understandable. They continue to live like that since the explosions of the nuclear power plant, and 5 years and 8 months later they are tracked down in a similar situation. To what extent do you want to tear the hearts of the victims? It is enough for the State to take a decision. This person says that the metropolitan prefecture of Tokyo has asked him to leave the housing, because the prefecture must return that housing for civil servants in March. It is monstrous that the State asks the Tokyo Metropolitan Prefecture to evict the evacuees and restore the house in proper condition. These were testimonies of displaced people. According to my research, to date there are 9327 vacancies among the housings for civil servants in the region of Kanto, including the Tokyo Metropolitan Prefecture and 6 other prefectures. It is enough for the State to take a decision, it can solve the problem, at least partially. Why should the inhabitants be expelled? Is it because, if there are tenants, those buildings could not sold during the financial bubble of the Olympic Games? It’s too cruel. On April 4 last year, according to the newspaper Mainichi shinbun, the state does not request reimbursement from TEPCO for the rents of dwellings “considered as temporary housings”. Commission member Iwabuchi mentioned earlier that the government will oblige TEPCO to pay for the costs of the decontamination work. Why don’t you ask TEPCO to pay the rents? These people are the victims! Finally, I would like to ask to the Minister. I would like you to answer two questions. 1st: You said that this is what the Fukushima prefecture wants. However, you are in a position to make suggestions to the Fukushima Prefecture. Please talk it over again. This situation is really irregular. 2nd: Please listen to the voices of the displaced. I think you have almost no opportunity to hear the voices of self-evacuees coming from locations outside the evacuation areas. Until then, you were too busy. Perhaps the people around you got acquainted with their testimonies. Please listen to them yourself. Today, too, they are here. There’s a break after this session. Could you give them 5 minutes? If you give us just 5 minutes today during the break, you can talk with the self-evacuees. I would ask you to answer these two questions. As I have already said, I am willing to consult with the prefecture of Fukushima, and I would like to ensure that the people concerned are not hurt. I will see to its smooth progress. You said that self-evacuated people are here. I also have a plenary session after and I do not have time, but I will listen to them. Mr. Yamamoto, you have exhausted your time. Please keep your promise. Thank you very much. ***** The measurements of ambiant radioactivity are taken at 1 meter above the ground. ******* Minashi kasetsu jyûtaku. Rental housing managed by private agencies inhabited by evacuees whose rent is borne by the central government or local governments.